While Hatha Yoga requires a strong and flexible body, Raja Yoga requires a disciplined and concentrated mind, and Jnana Yoga requires a keen intellect, the only requirement for Bhakti Yoga is an open, loving heart. GOAL: To develop a personal relationship with the ‘divine’, which could include a higher power, nature, or the self. HOW TO GET THERE: Prayer, chanting or your own preferred way of expressing devotion. Bhakti means “devotion” or “love” and this path contains various practices to unite the practitioner with the Divine. Bhakti Yoga is considered the most direct method to experience the unity of mind, body and spirit. This deeply spiritual practice draws heavily on the Hindu deities. Each of these deities is seen as representing a human aspect of the single Godhead or Brahman (similar to the way Christian saints represent specific attributes and qualities of God). The use of Hindu deities in Bhakti Yoga can be a large obstacle for Western practitioners, especially for those with a deeply religious background. But the use of the Hindu deities is not required for this practice. The most popular limb of Bhakti Yoga in the West is Kirtan, with national and local Kirtan walas performing weekly in small to large cities. Bhakti Yoga can be practiced by itself or be integrated into other types of yoga or spiritual practices. I absolutely LOVED this podcast and wanted to be sure to share it with you. The human body (which is made up of about 100 trillion cells) begins as a single, newly fertilized cell. Nutrients need to get through the cell membrane, and once inside, the cell metabolizes these nutrients and turn them into energy that fuels its life functions. As a result, waste is generated and needs to somehow get back out through the membrane. Any impairment in the membranes ability to let nutrients in, or waste out, will result in the death of the cell via starvation or toxicity. The observation that all living things take in nutrients provides a good understanding of Prana, which is what nourishes a living thing. Prana is not only what is brought in as nourishment, but also the action that brings it in. The yogic concept that complements prana is apana. Apana refers to what is eliminated as well as the action of elimination. Prana and Apana describe the essential activities of life. In order for a cell to thrive, certain conditions need to exist. The cell needs to be permeable so nutrients and waste can pass in and out of the cell, but it can’t be so permeable that the cell wall loses its integrity. Let’s look at the things that happen at the start of life on earth. Being born means being severed from the umbilical cord, which has sustained you for nine months. Suddenly, and for the first time, you need to engage in actions that will ensure your continued survival. The first breath causes blood to surge into the lungs; the right and left sides of the heart to separate into two pumps; and the specialized vessels of fetal circulation to shut down and seal off. Your first breath is the most forceful one as it needs to overcome the initial surface tension of your previously collapsed, fluid-filled lungs. Another first time experience that occurs at birth is the weight of the body in space. Inside the womb, you are in a weightless, fluid filled environment. At birth, your universe expands and you can move freely in space, your limbs and head can move freely in relation to your body and you must be supported in gravity. Right away, you have to start DOING something, you have to find nourishment, which involves a complex action of simultaneously breathing, sucking and swallowing. All the muscles involved in the act of survival create your first postural skill – supporting the weight of your head. Postural development continues from the head downward, until you begin walking, with the completion of your lumbar spine at about 10yrs old. To summarize: At birth you are confronted by two forces that were not present in utero: breath and gravity. The practice of yoga can be seen as a way to consciously explore the relationship of breath and posture. In the language of yoga: Life on this planet requires an integrated relationship between breath )prana/apana) and posture (sthira/sukha). When things go wrong with one, they go wrong with the other. Natural ways to relieve pain. As most of you know, I have been dealing with a sick dog for the past few months. On top of his torn ACL, he has also been diagnosed with an arthritis that is very similar to Rheumatoid Arthritis. He has been in a lot of pain and I have done extensive reading about how to help him live a relatively pain free life. We have had major success with a few tweaks in his diet and all the research I have done is relevant to humans, and animals alike. Here’s what I have found! Sugar: processed sugars trigger the release of inflammatory messengers called cytokines. Saturated Fats: saturated fats trigger adipose, or fat tissue inflammation, which is not only an indicator for heart disease but it also worsens arthritis inflammation. Pizza and cheese are the biggest sources of saturated fats in the average American diet. Other culprits include meat products (especially red meat), full-fat dairy products, pasta dishes and grain-based desserts. Trans Fats: Known to trigger systemic inflammation, trans fat can be found in fast foods and other fried products, processed snack foods, frozen breakfast products, cookies, donuts, crackers and most stick margarines. Omega 6 Fatty Acids: The body needs a healthy balance of omega-6 and omega-3 fatty acids. Excess consumption of omega-6s can trigger the body to produce pro-inflammatory chemicals. These fatty acids are found in oils such corn, safflower, sunflower, grapeseed, soy, peanut, and vegetable; mayonnaise; and many salad dressings. Refined Carbohydrates: white flour products (breads, rolls, crackers) white rice, white potatoes and many cereals are refined carbohydrates. Processed carbohydrates may trump fats as the main driver of escalating rates of obesity and other chronic conditions. MSG: mono-sodium glutamate (MSG) is a flavor-enhancing food additive most commonly found in prepared Asian food and soy sauce, but it can also be added to fast foods, prepared soups and soup mixes, salad dressings and deli meats. This chemical can trigger two important pathways of chronic inflammation, and affect liver health. Gluten and Casein: Common allergens like gluten and casein (proteins found in dairy and wheat) may also promote inflammation. Gluten is found in wheat, rye, barley and any foods made with these grains. Casein is found in whey protein products. Alcohol: Alcohol is a burden to the liver. Excessive use weakens liver function and disrupts other multi-organ interactions and can cause inflammation. 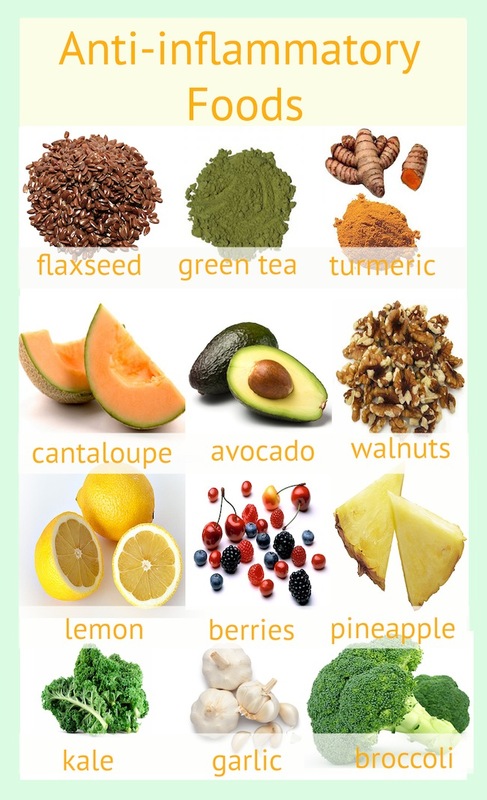 Introduce Fish Oil and more of the foods in this image below to your diet. *Please note that garlic is toxic to dogs, do not feed your dog garlic. One of the effects of dehydration is stiffness of the muscles leading to pain in various parts of the body, including headaches. Dehydration can occur due to lack of adequate water intake, decreased electrolyte intake, or increased intake of coffee or black tea. Ensure you are drinking at least 1-2L of water per day, and remember to replace each cup of coffee with 2 cups of water. 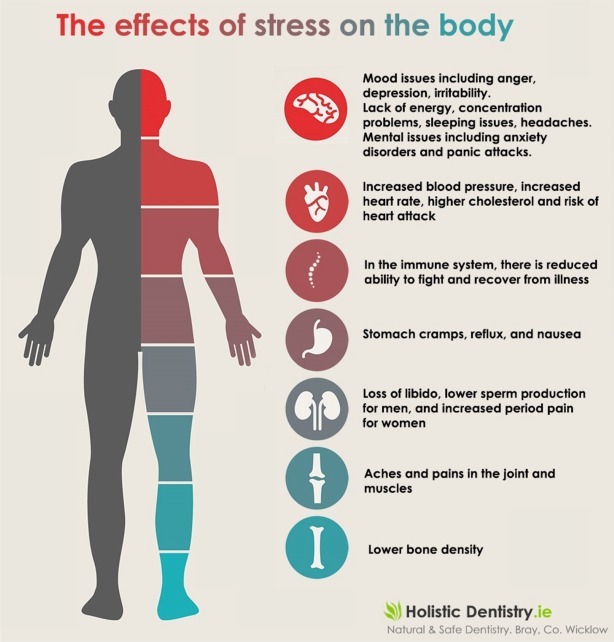 Your body and mind are intimately connected, and stress can manifest itself in many ways in the body. One of our first reactions to any stressor is tightening and tensing of our muscles, especially the muscles in our back, shoulders, and neck. Chronic stress is also linked to sleep disturbances. Sleep is restorative and regenerative and without adequate sleep our body doesn’t get the chance to heal. This can contribute significantly to aches and pains throughout the body. In order for our muscles and our joints to receive nutrients, stay healthy, and work for us, we need blood flow to these areas. Blood flows properly through our body when we move our muscles and joints, and so to promote adequate blood flow, we need to dedicate time every day to movement. Many of us spend most of our days sitting at a desk, or in a car while commuting. To incorporate more movement in your day, try taking the stairs instead of elevators or escalators and get up every 30 minutes to go for a quick walk. The best way to incorporate exercise is to find something you enjoy that gets you moving and do it a few times a week. In addition to moving, we also need to stretch our muscles to prevent stiffness. Tight stiff muscles not only contribute to back pain, but can also lead to headaches and joint pain. Yoga is a great way to increase blood flow as well as stretch all the muscles in our body that would otherwise not get stretched. We need certain vitamins and minerals for many processes and reactions in the body, and unfortunately the Standard North American diet often doesn’t provide enough nutrition. One example is the lack of magnesium in our top soil, which is required for relaxation of muscles as well as many other processes in our body. A magnesium deficiency can manifest in various ways including muscle pain, joint pain, chronic headaches, and constipation. Improve your vitamin and mineral status by including a variety of vegetables and fruits and focus on getting more whole natural foods in your diet.